The combination of “rock” and “billy” is derived from the two musical genres, the classic Rock and Roll and country music from the 40’s and 50’s which is also known as “hillbilly”. Now widely known and followed by a great number of enthusiastic devotees, this modern sub-culture is simply called rockabilly. In the United States many of the artists had their origins in western swing, rhythm and blues, Appalachian folk music and of course boogie-woogie. Since the 70’s, old style dance forms a central part of the rockabilly revival. Here in Sydney the movement is big, and I attended a couple of regular dance nights, that just buzzed with colour and energy. Their fashion is right out of the 50’s, with labels for guys and gals marketed in key locations around the world. Dozens of labels like Voodoo Vixen, Soupuss and Tripp NYC a sample of the many offering the latest designs and patterns. Halloween inspired fashion and paraphernalia is also big with labels like Zombitch and Kreepsville – freaky and creepy sells. 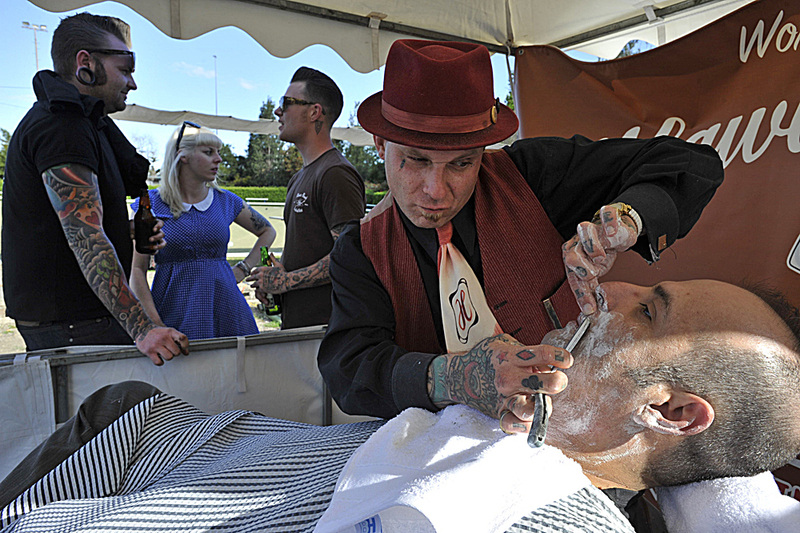 Here in Sydney, a monthly gathering for a rockabilly market provided a wonderful opportunity to photograph the faithful. Sporting the latest gear and hairstyles, this alternative mainstream in their 20’s and 30’s were liberally ‘inked up’, and made for wonderful subjects. From Los Angeles, this barber/stylist was invited by a local Sydney salon to ply his trade in the trim rockerbilly style. A consummate professional, he prided himself on giving his customers the perfect shave. I watched for some time, impressed with his style and precision, his tool of trade, the trusty cutthroat. He had a great pair of hands and amazingly placed no time limit on delivering the perfect job. This entry was posted in Rockabilly, Uncategorized and tagged fashion, rockabilly, shaving, tatoos by Paul Nevin. Bookmark the permalink.